Thanks for visiting us at PRI 2014!! Thanks to everyone that came to see us at PRI Indianapolis this month. It was a fantastic trade show and we got to meet some old friends and made some new ones too. The days were packed full of visitors and the weather was not as brutal as 2013 either. A great chance to network and show everyone what we can do! Cable Assemblies come in all shapes and sizes. Here at St. Cross Electronics, our engineers are used to answering questions regarding cable assemblies, such as what custom fitting and cable combinations are available, what performance characteristics are tested, and what are the standard manufacturing turnaround times. So, in this blog we will give a few points of our experience showing you why you can trust St Cross Electronics to manufacture your cable assemblies. The benefits of St Cross Electronics Cable Assemblies include the following. Customised: As a manufacturer, we work with each of our customers to identify the application and help you choose the right product for the job. In addition to the many stock hardware and cable combinations we offer, we can make nearly any custom assembly design you need. From RF, LVDS, Looms, IDC, Network, Motorsport spec looms, Aircraft spec looms and Medical spec cable assemblies. One stop shop: Rather than having to go to many different vendors for your application, St Cross Electronics will be able meet all of your requirements. From the copper cable to the connectors and crimp terminals all the way through to final test and inspection. We have the expertise and the experience to get it done right. Large inventory: We maintain a large inventory of copper cable including discrete wires and multicore cables as well as a huge range of crimp terminals and connectors to ensure that we are able to deliver on short turnaround times. On top of that our huge range of tooling enables us to react very quickly, sometimes less than 24 hours. St Cross Electronics focuses on quality and performance above all else. QUALITY IS KEY!! Everything we manufacture is 100% electrically tested to a wide range of standards, and all crimp terminals are tested to destruction on set up. Are you ready to place a cable assembly order with us? Please contact our excellent team and I am sure we can help with your requirements. 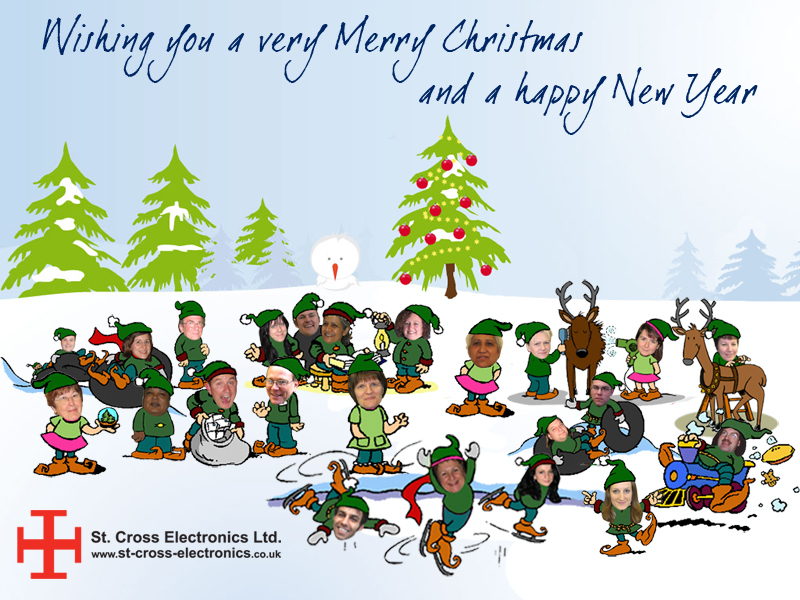 We would like to wish all our Customers, Suppliers and Partners of St Cross Electronics Ltd. Thank you all for your support throughout this year, we wish you all a wonderful Christmas and a fantatsic New Year for 2015! Please note we will be closing on Christmas Eve and will re-open on Monday 5th January 2015.